Starting in college, I began getting tattoos that represented various facets of my personal philosophy. Considering the direction of my life, it seems rather prescient that my first tat was “the Road is Life” from Kerouac’s On The Road. Now, 15 tattoos into my inkification, I have added one more literary icon to my chest plate: Mark Twain. I have always been a fan of the great American satirist, even taking a course in college devoted entirely to him (taught by the incomparable Susan K. Harris), but this was the first quote of his that struck me not as more than just a pithy insight, but also a universal truism. In fact, I didn’t come across this quote through reading Twain. Instead, this phrase was brought to my attention while reading Touched With Fire by Kay Redfield Jamison, a masterful investigation of the link between bipolar disorder (or manic depression) and the artistic genius. I cannot recommend highly enough this scholarly exploration of mental illness and creation. So rarely does a book tickle both the right and left hemispheres of the brain like this work does. 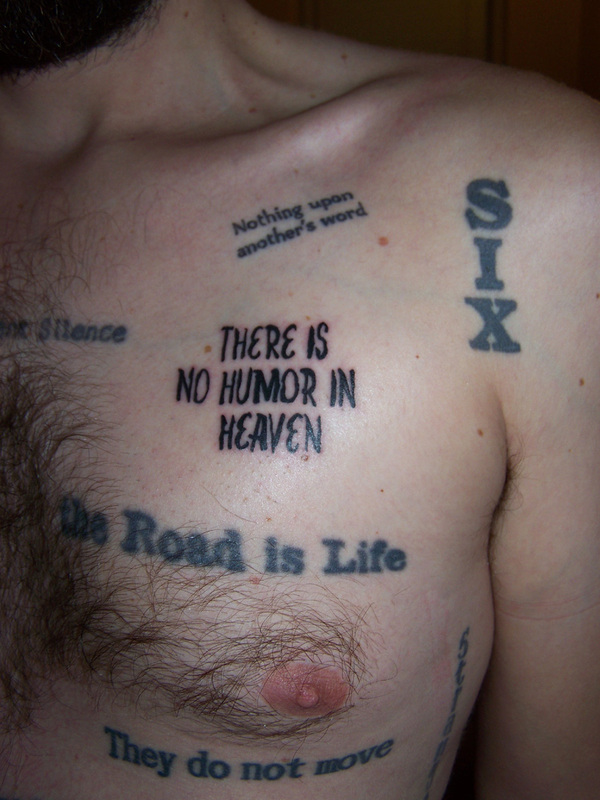 So why did this quote stick out so much that it would earn valuable (and ever dwindling) skin on my chest? Over the years of this blog, I have written about both my personal struggle with mental illness as well as my adoration for the art of stand-up comedy. If you have any familiarity with comedy, you’ll immediately know why those two are linked. Stand-up comedians are generally known as miserable people in real life, the type who will turn their personal misery into comedy gold for an audience. With the uptick of popularity for the form in the last couple decades, that is by no means a rule anymore, but the great comedians from George Carlin to Louis CK, from Don Rickles to Maria Bamford have always pulled their best material from personal darkness. 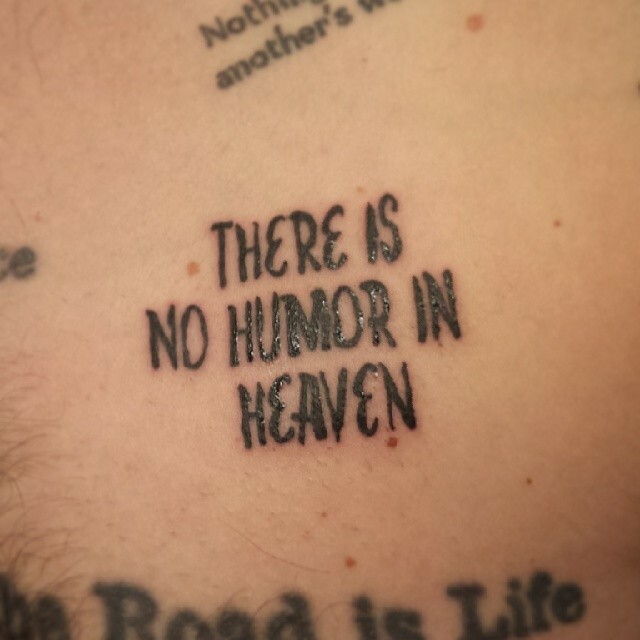 Humor doesn’t come from the perfect peace of heaven, it is formed in the stark despair of hell. Twain’s quote could be limited to the art of humor and it would still be profound (especially considering that he remains the greatest American humorist of all time), but I believe that he meant to convey even more in those simple words. It’s not just humor that is forged out of hurt. The basic creative spark is birthed there, too. Are there musicians and writers who have created great works without suffering from mental illness or facing horrific life events? I’m sure. But they’re the minority. Any study of artistic achievement and mental illness will reveal that the two are intrinsically linked. * A creative mind will create regardless of circumstances, but creativity spurred on by the dark nights of the soul will almost always produce works of grander, more universal elegance. As technology advances and our ability to predict the genetically preordained occurrence of depression grows stronger, our society will face the challenge of whether we should pre-select for healthier, non-inflicted offspring. The question of whether or not mental illness in general (and depression, specifically) has its benefits in human society and art is one that we will likely never satisfactorily resolve. But, as long as such ailments still exist, we can take solace from the truth that the erstwhile Samuel Clemens articulated so many years ago: There is no humor in heaven. *This is also likely true of important scientists, but I haven’t studied that enough to make a definitive statement.